Description: Alex is a teenage fisherman from a nearby village that is somewhat close to Aquapiper Academy. He is pretty much a normal boy who loves to fish. Some say he takes his hobby from his father, but unbeknownst to a lot of people, Alex’s father hates to fish, which is why he and Alex are a little distant. Not a lot of people in Alex’s village knew that Aquapiper Academy is close to them, including Alex, hence why he used to fish near there without realising there may be Bernumaids underneath. He is Ianassa’s boyfriend, or at least Ianassa appoints him as such. It is unclear why she loves shim so much, but it is perhaps due to Alex’s strong arms. Despite his scrawny appearance, Alex actually has a really good reeling arm. Ianassa even claims that one time Alex thought he caught a giant whopper with his fishing line, when it was actually a sunken boat, and yet he still managed to reel it up. Ianassa claims a lot of things, but there may be some truth to that one in particular. Whatever union Alex and Ianassa might have had, the two get along great with each other, even if Ianassa does boss him around a bit sometimes. His overall nice demeanour is pretty charming and sometimes accepting of Ianassa’s mischievous behaviour, and he seems to genuinely care for her. Maybe because he appreciates Ianassa’s company during his fishing trips and catching fish is all the more satisfying to him when Ianassa eats some and loves it. Alex has been dragged into another shenanigan with Ianassa, only this time it’s a real emergency, as the Skorned have attacked Aquapiper Academy. It’s unclear what Ianassa thought he could do against the Skorned with his current abilities, but that just shows how much she overestimates him. Appearance: Alex is about the average height of a 16-year old boy. He has a very scrawny look and a bent posture when he stands. He has shortish black hair with dark green eyes. His attire is very standard fisherman wear, with a very natural colour scheme; mostly greens and beiges. 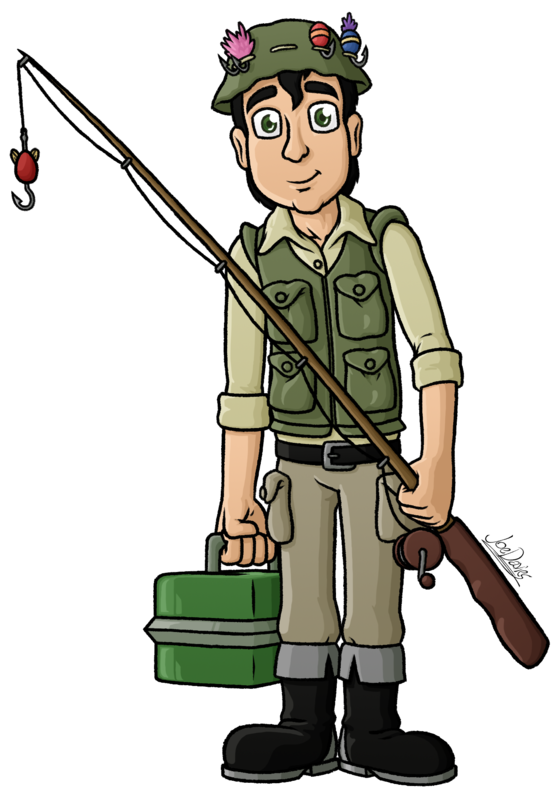 He always carries around his regular fishing rod and his green metal box full of fish bait. And his fisherman cap has knots in it that hold several of Alex’s fishing hooks and lures. – Alex’s design and posture are influenced by that of Shaggy from ‘Scooby-Doo‘.